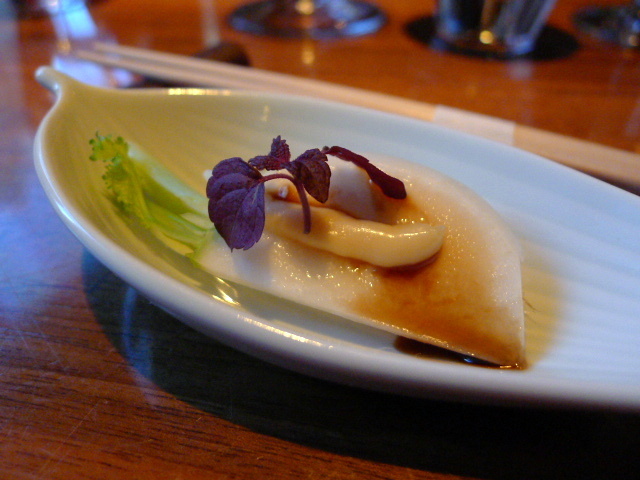 Umu is a one Michelin-starred Japanese restaurant located in Mayfair. 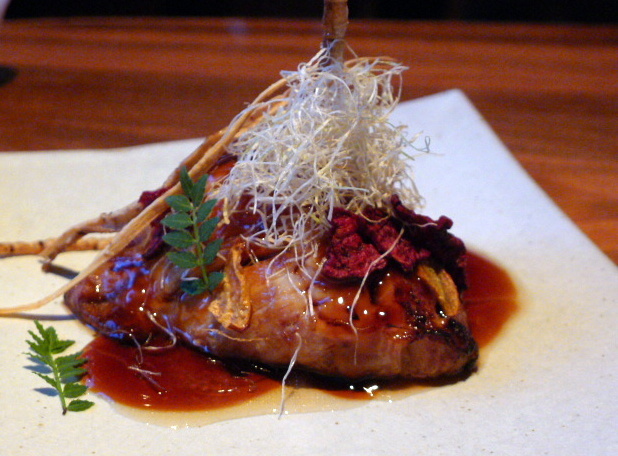 The executive chef behind Umu is Yoshinori Ishii, a chef with 20 years of high end cooking experience. Chef Ishii previously spent nine years at Japan’s three Michelin-starred Kyoto Kitcho. This was followed by postings as the head chef at the Japanese Embassies in both Geneva and New York and as the omakase chef at New York’s Morimoto Restaurant. Umu offers an à la carte selection of cold and hot starters, traditional and modern sushi as well as main courses. But Umu is perhaps best known for offering a kaiseki menu, a multi-course Japanese dinner which draws on traditional Japanese cooking skills and techniques to harmoniously balance the taste, texture, colour and presentation of the best seasonal ingredients that are used in the preparation of this meal. As well as the standard kaiseki menu, Umu also has a sushi kaiseki menu option, both priced at £100. We eased into our meal with an amuse bouche of turnip with an unusual pairing of espoisse cheese, wasabi and a balsamic vinegar reduction which proved to be very tasty. It was an unusual concept but it worked surprisingly well. The à la carte selections caught my eye and I rue the day that I did not take up our waitress’s suggestion to have a plate of the tuna tataki (£20) each instead of sharing one for it was utterly divine. 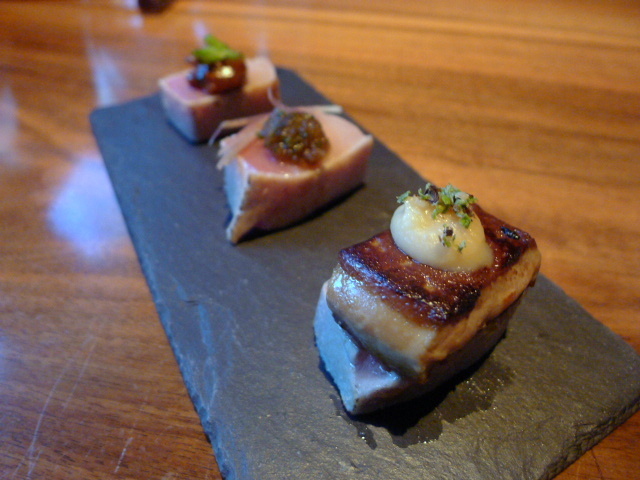 Served 3 ways, the rich unctuousness of foie gras with the savoury overtones of the fresh delicious tuna proved to be a winning pairing. Other combinations of a ginger-like myoga chirizu and miso topping, and ginger with shishito peppers were also extremely tasty. What was impressive was the level of finesse demonstrated by this dish. An oyster trio (from bottom right in a clockwise direction), three oysters each with caviar, chirizu and shiro miso (£18) proved to be incredibly complex with its interesting and well-judged combination of ingredients. 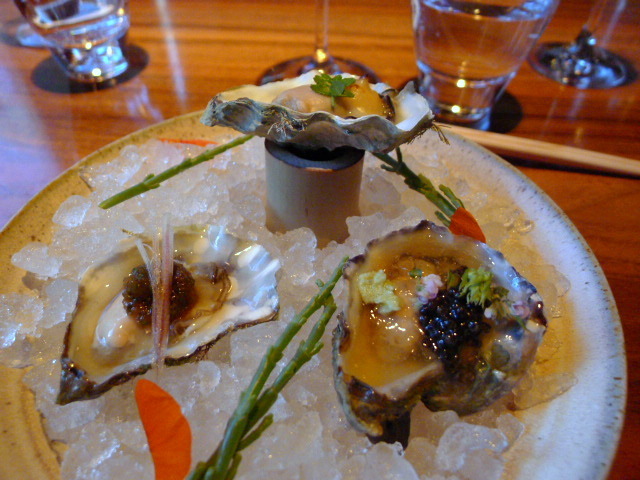 The caviar oyster was married with a tomato jelly, wasabi and shiso which provided acidity, spiciness and aroma. The chirizu oyster combined a ponzu sauce with a topping of fresh daikon and chives for a delicate punchy kick, and the shiro (white) miso oyster with a kinome leaf showcased earthiness with the use of the miso. 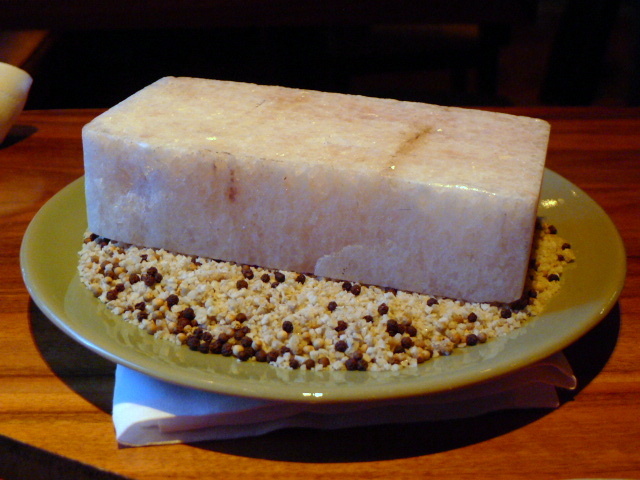 Umu offers both a traditional and modern sushi selection. 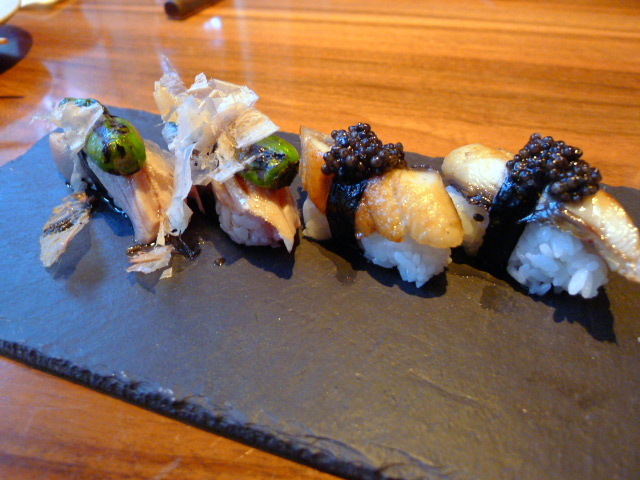 From the latter we selected the eel with Oscietra caviar (£12) and the toro with shishito pepper (£8). The subtlety of the eel with the caviar was lovely, and the toro was beautiful, although the pepper was a touch strong against the gentle flavour of the fish. The rice was wonderfully light and fluffy and perfectly judged for the vinegar. “Fuwa-fuwa” foie gras and dashi soufflé (£11) was visually arresting as it came to our table. 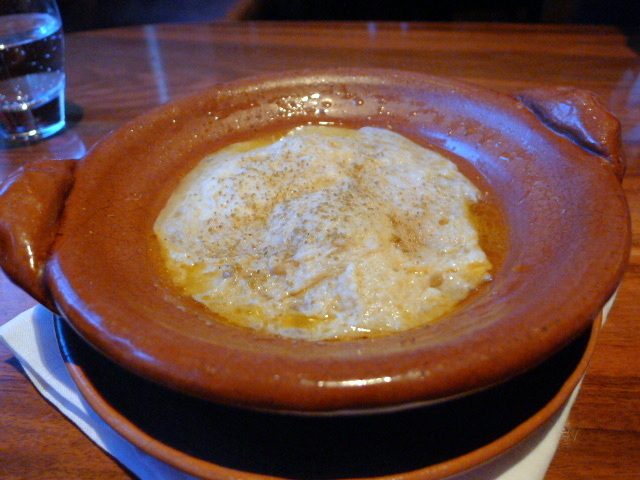 The soufflé, being a foie gras broth containing foie gras and topped with a thin layer of omelette, bubbled away to produce the “fuwa-fuwa” effect. The broth might have been a touch salty, but it was intensely reduced for a concentrated and winning foie gras flavour. 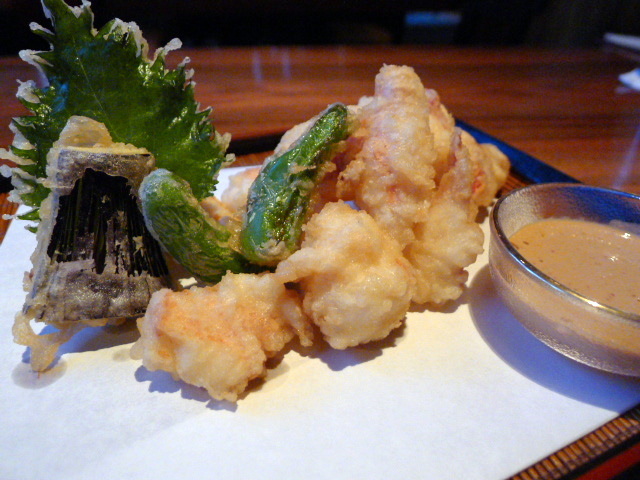 Wild lobster tempura (£45) was wonderfully sweet and flavoursome. The lobster had been beautifully cooked and was lovely and moist. The batter was terrifically light, although not quite as crispy and flakey as some other types of more traditional tempura batter. The lobster was accompanied by some seasonal vegetable tempura which included shiso, aubergine and peppers, and a light and creamy coral sauce made with crab, double cream and soya sauce. Grade 9 wagyu (£65) cooked at the table on a Himalayan rock salt heated to 120c and served with wasabi soy, sesame sauce and yuzu koshyo was a demonstration of harmonious eating. The subtle heat of the rock produced a gentle cooking effect on the beautifully fatty meat which also helped to season it. Black cod cooked with a Japanese pepper grill marinade (“kinome-yaki”), was wonderfully fresh and flakey and of an excellent quality. Served with root vegetables and a sweet soya sauce (£35), the latter was lovely although I would have preferred slightly more sweetness in the sauce. 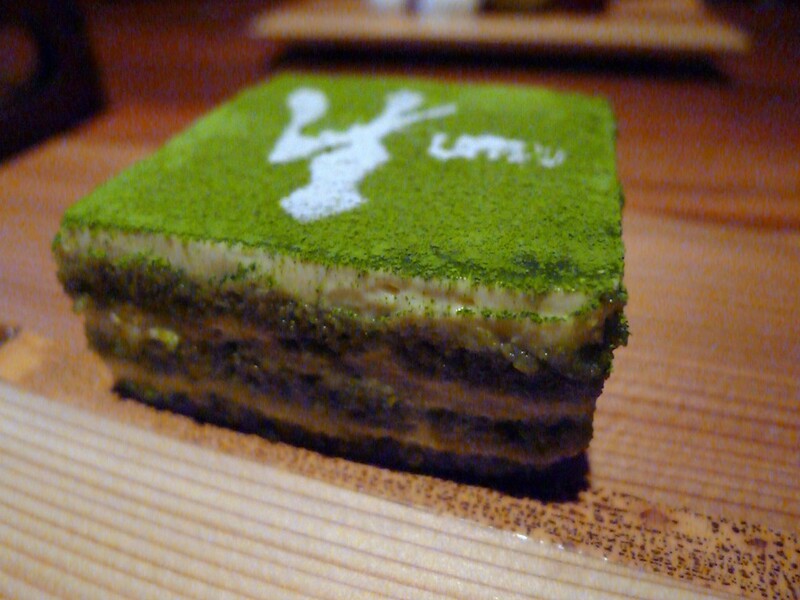 A green tea tiramisu (£10) made with green tea powder was light and creamy. However there was a slight bitterness coming through from the powder. Sesame panna cotta (£12) proved to be a good, fun dessert. 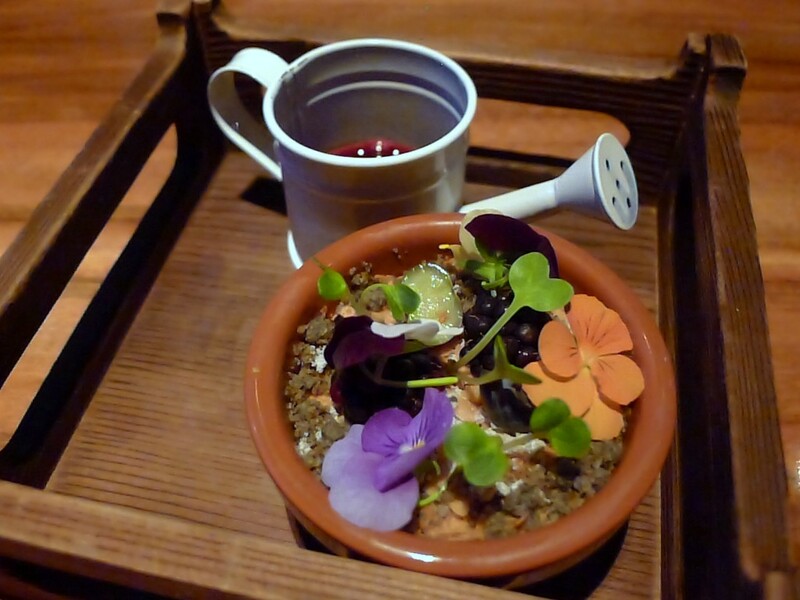 Presented as a little flower garden with an edible topping of flowers and leaves, the accompanying blackberry syrup was served in a pouring can for an interactive effect. The panna cotta was well made and deliciously velvety. 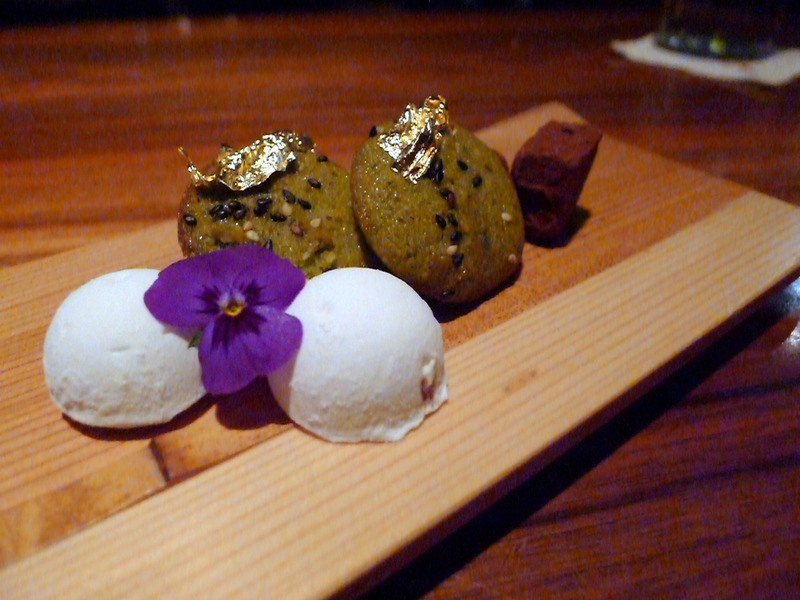 Petit fours included zingy yuzu marshmallows, buttery green tea financiers and luscious chocolates. A brown rice tea rounded off the meal nicely with its nutty, hearty flavour. I hear Umu is a favourite of the staff at the Japanese Embassy in London and its easy to see why as the food resonates with a dainty elegance. The standard of the cooking dazzled, and the execution impressed with its precision and finesse. The service was attentive and knowledgeable and the beverages selection was very comprehensive. As well as a great classic wine list there are about 150 bottles of sake for what is one of the largest sake lists in Europe. This was a high end experience far removed from the ordinary. If you are interested in reading about Chef Yoshinori Ishii’s foodie adventures, you can check out his blog here. Price range: The kaiseki menu is £100. Cold and hot starters range from £6 to £45, mains from £21 to £65 and desserts from £10 to £12. Excludes drinks and service. I agree with Ultimate Sushi – a great blogpost, well written and good photos. 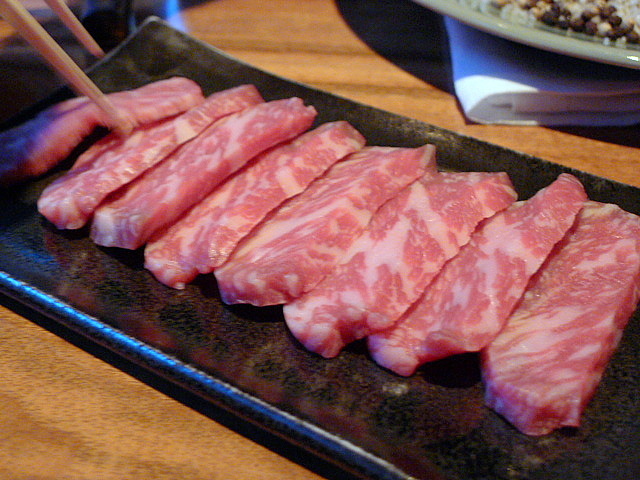 I came here as Umu is one of my customers (they buy the Wagyu from us) and was really impressed with the pictures. Thanks for your comment! I’m glad you enjoyed your meal at Umu.